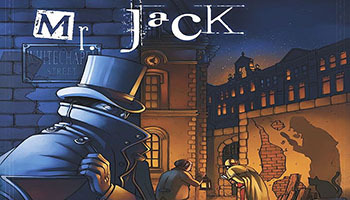 In Mr. Jack, one of the two players represents Jack the Ripper, who will be one of the eight characters on the board. This player knows which character is Mr. Jack, and his goal is to flee from the district as soon as possible (or avoid being accused for eight turns). 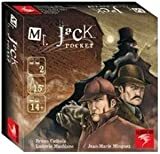 The other player represents an independent investigator (not represented on the board) who tries to guess the identity of Jack - but he can make only one accusation during the game! During each turn, the players move the characters, using their special powers and placing them either in shadow or light. At the end of each turn, the witnesses declare whether Jack is visible - that is, in light or adjacent to another character - or not (alone in the shadows). This allows the investigator to know which characters are innocent. As the turns progress, the investigator tries to eliminate suspects while Jack tries to escape. Intuition, logic, and cold blood will be necessary for each of the two participants. 888 - London - Whitechapel. The night covers the gloomy alleys with a veil of darkness. Jack is moving in the shadows... 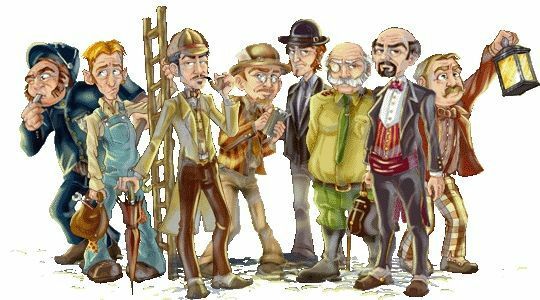 The finest investigators of the gaslight age have gathered here to catch him before he uses the darkness to slip away for good. The trap is slowly closing upon him... But Jack is cunning. He is in fact impersonating one of the investigators... Will the others unmask him? The silver circle shows the possible movement of the character. There are eight different characters. When a character is used, it must move and/or use its Special ability. The symbols on the card show what the character's special ability is and when it must (or can) be used. The golden circle shows the ability of the character. Q: When I use a character, can I leave it on its starting point? A: No!! When a character is used, it must move at least one hex and cannot end his movement on the same hex from which it started. Q: When I move a character, can I cross hexes on which another character is standing? A: Yes!! The characters do not block movement.